About how large was this earwig would you guess? given the earwigs I've seen. Much larger than some of the soil-dwelling earwigs I've encountered in the past. If stretched from out completely, I'd say he might be about an inch long or so. It has the general shape of a Labidura, but too few antennal segments. 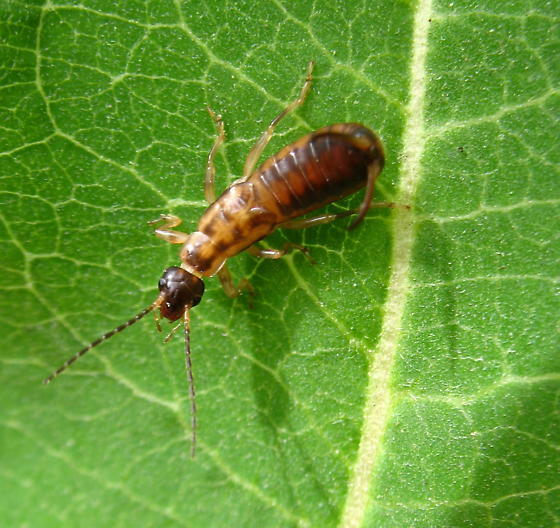 However, most identifying characteristics for adult earwigs seem not to be very reliable for juveniles so that could possibly be discounted. The biggest issue for me is the range. This species has only been reported from the southern states so finding it in Maryland would be quite odd. I'd leave this one to the experts if any frequent this site. This might be a new species for the guide or an undescribed species of Labidura. Very peculiar find. would be easy, if you think it would prove worthwhile. If you can find individuals of the same species, I'd say go for it. The best way to determine the species would probably be to raise the nymphs to adulthood, then take detailed pictures of the legs, forceps, and antennae. They might be something totally obvious once they mature, or they could be something completely new and then you'd have specimens. and fill in the date field.